Visit and tasting at a prestigious, local winery offering small production wines. 3 Course Traditional Gourmet lunch at a winery. Expert Food & Wine guide will tell you all about the region. On this guided tour of the land of Ribeiro from Vigo you will visit the historic and well preserved Old Town and Jewish Quarter of Ribadavia, the capital of the Ribeiro wine producing region and famous for its annual,medieval festival. Ribadavia is in the interior of Galicia at the confluence of two rivers surrounded by mountains and vineyards. The tour involves a guided walk around the beautiful Old Town and its medieval quarter We will visit the local winery Casal de Arman near the town tasting their award winning wines of D.O. Ribeiro followed by lunch at the winery which will involve tasting the local products of the area. Your Food, Wine & Expert Guide will meet you at the starting point in Santiago. An excellent option for those who would like travelling and walking, learning about local wines and the region and who enjoy a good lunch. RIBADAVIA: Ribadavia lies at the confluence of the rivers Avia and Miño surrounded by mountains in the interior of Galicia. It’s medieval Old Town and Jewish quarter which was established in the 11th century are well preserved. You will explore its cobbled streets including the old, fortified Castle and admire some of it’s old churches like the 12th century Santiago Church and other monuments like the House of the Inquisition. You can see the oldest tavern in Galicia, Papuxa which dates back over 500 years. Try a jewish cake/sweet from the pastry shop, Tahonia Herminia. In the Praza Maior, the town’s main square you can stop and have a coffee in one of the numerous terraces. Ribadavia is the capital of the Ribeiro wine producing area and the town’s outskirts are surrounded by vineyards. Wine has been cultivated here for over 1000 years and it’s white wines are arguably some of the best in Spain. WINERY VISIT, CASAL DE ARMAN: Casal de Arman is an award winning winery, restaurant and hotel complex dating back to the 18th century which is situated just outside Ribadavia. It’s perched on a hill so you can admire the amazing views of the beautiful vineyard landscape. 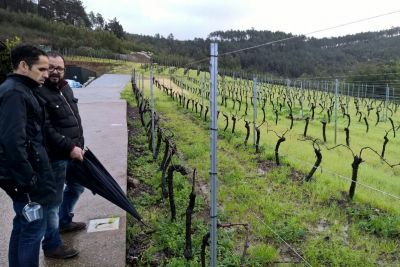 It comprises of 20 hectares of vineyards dedicated to the cultivation of autochthonous grape varieties like the white teixadura, godello, albariño and loureira; and red brencellao, caíño and sousón varieties. As well as tasting their variety of white and red wines lunch will be served in their restaurant which is packed with character. The food is traditional with a touch of modernity. Local quality products are mainly used in this kitchen (steaks, cured meats, octopus, vegetables, fish from Vigo estuary…)combined with new tastes and textures. We travel by road until reaching the attractive Old Town of Ribadavia in the D.O. Ribeiro wine region (about 1hr approx. drive). We will enjoy a walk around the Old Town seeing the main sights and will have time to stop for a coffee and a cake too. After that we will take a short trip by road out of Ribadavia between vineyards until we reach our next stop, the winery Casal de Arman. Then we have a special tasting at the winery trying both their whites and reds. After this we enjoy a gourmet lunch in the restaurant of the winery. Return to Vigo by road. English-Speaking Food & Wine guide specializing in Galicia. Winery tour with special tasting. Tip and Gratuities to Chauffeur-guide.